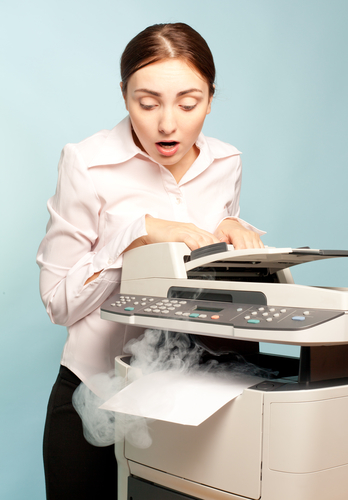 Depending on your industry, your office may rely heavily on its printer. Printers allow you to create hard copies of important documents and contact clients and associates in a more personal manner than e-mails and messaging. However, office copiers that are used often to print a large number of documents are more likely to break down than others. But how often is too often, and what is a normal timeline for your printer to break or malfunction? Below, Laser Line, a copier repair and retailer in Jessup, MD, explains how often you can expect your printer to break. The expected lifespan of an inkjet printer is three years, and the lifespan of a laser printer is five years. During this time, your printer should ideally only break down once a year. However, this number is subjective. Printers that are used daily to print a high volume of documents can break down much more often than once a year. In fact, many office managers and employees report experiencing their printer jamming or malfunctioning as often as once each week. Obviously, there is a huge discrepancy between having a printer or copier break down once a year and once a week. So what can be done to help keep your printer in good shape? Firstly, try to be as gentle with your printer as possible. If you have to print a large number of documents on a regular basis, consider purchasing a second office printer. The cost of the printer will be offset by the money you save on repairs. Next, assess what causes these breakdowns. If your most common problem is paper jams, then the solution may be as simple as fanning your paper properly before loading the printer. Finally, schedule a technician to come in for routine maintenance once every six months to ensure that your printer is running smoothly, and to avoid any larger issues. To schedule printer services, or to purchase supplies for your printer or copier, call (410) 636-1700 or visit the Laser Line website.